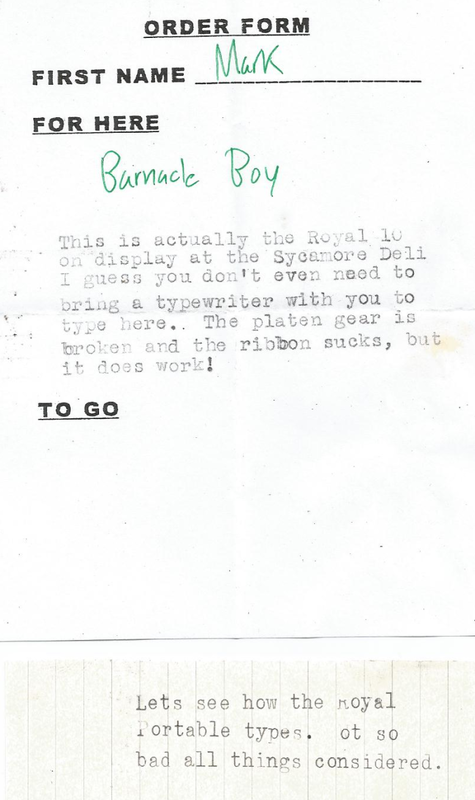 Who knew typewriting could get you a beer? Must try that sometime. It really does keep getting better and better. I just had an idea.... A cafe filled with Typewriters that you could cruise in, sit at and type with while sipping on a Latte.... Or perhaps just a balls-n-all manly coffee. I've had a vision for a writer's hangout in a college town where you can sip a latte and borrow a typewriter. I think a patron would put some money down as collateral which they would get back after they left. Maybe upstairs would be many little rooms with just a desk and a window looking out into the busy street below which people could rent monthly or maybe just by the day to work on projects. If I make big bucks on a book and have money to burn such a place will exist. May I steal your idea if my books sell? This would go over very well in my town! Absolutely! The more of these whatchamacallits the better. We also need a store that would be like an invention shop and it would sell components like Radio-Shack used to but more. Little springs and levers and screws and capacitors and resistors and wire and motors and servos and so forth. I need a 1/8" torsion spring right now and I cannot find one for sale anywhere (except online, where there is shipping and such). Imagine a shop full of little stock parts for fixing things! Tell me how you guys go, if you manage to do this! I'm not sure such a place could work out here in Queensland - AU, but maybe if I was in Melbourne. I like the sound of that though. Oh hang on.... Hang on... Thinking, thinking.... OHHHHHHHH......... I just had an idea! Scott, I just made the connection yesterday that you are The Filthy Platen. Your blog was made me want to do mine. Thanks a bunch! This place has all the parts anyone could need! I will buy from them soon. The Royal Portable has the very very nice Medium Roman typeface. The typeheads were even fairly clean on the Portable. I need to find one like it somewhere, it was very nice to type on.